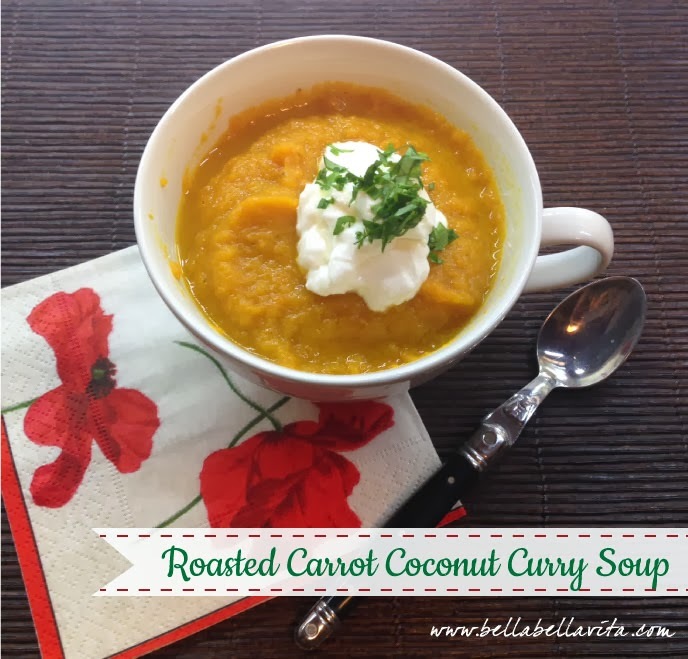 I've been on a coconut kick lately, so I decided to tweak my Roasted Carrot Ginger Soup recipe and add coconut and curry powder. I love how it turned out and once again, I found myself licking the bowl when I had finished! As mentioned in previous recipes, I love roasting my vegetables for soups as it adds so much depth to the flavor with the caramelization. This recipe is super easy and quick. Enjoy! Spray olive oil on baking pan covered with aluminum foil. Arrange baby carrots in a single layer on the pan and roast for 30-35 minutes until tender and caramelized. Using a microplane, grate ginger into the onion and saute for 2 minutes. Add curry powder, freshly ground black pepper and salt and give a quick stir for a minute so that it coats the onions and becomes fragrant. You can add the salt & pepper at the end, but I find it melds into the soup better when added at this stage. Add roasted carrots, coconut milk and chicken stock. Cook over medium high heat until thoroughly heated (approx 10 minutes). Add additional salt & pepper to taste, if desired. Add more or less chicken stock depending on your preference. I tend to like a thicker soup and used 3-1/2 cups when I made the recipe. I use my toaster oven to roast the baby carrots. I find it much easier to use than my oven. I roast all kinds of things in my toaster oven -- I find that it caramelizes the vegetables better than my oven, probably due to the smaller oven space.